Inequalities are evident in early childhood caries rates with the socially disadvantaged experiencing greater burden of disease, including families with a refugee and migrant background. 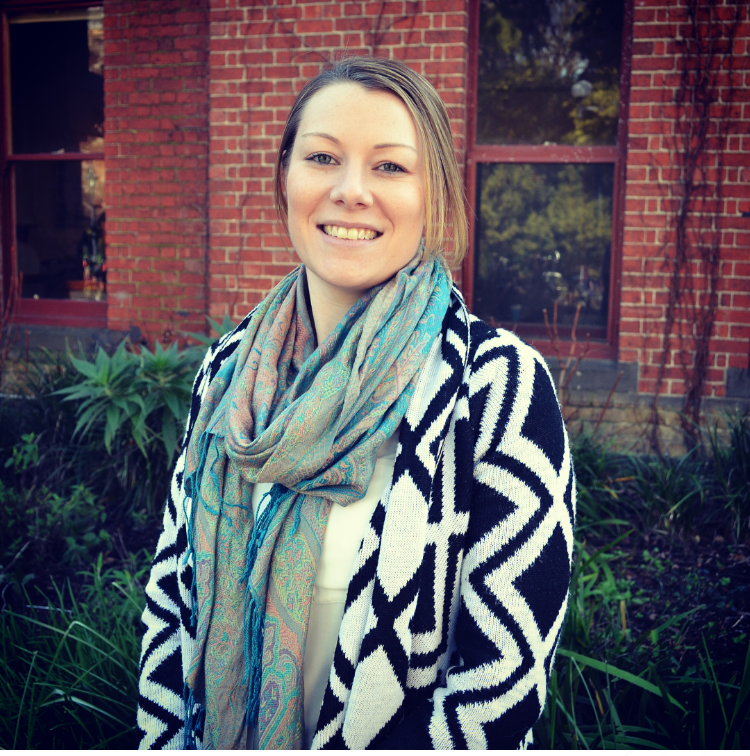 The Teeth Tales research study began in 2006 due to community concerns for the oral health of children from a refugee or migrant background residing in the Moreland and Hume local government areas (LGAs) of Melbourne. Our preliminary research showed that oral health programs and services were not reaching refugee and migrant communities who are at an increased risk of poor oral health. Through a qualitative study conducted in 2006 – 2009 the sociocultural influences on oral health were explored. 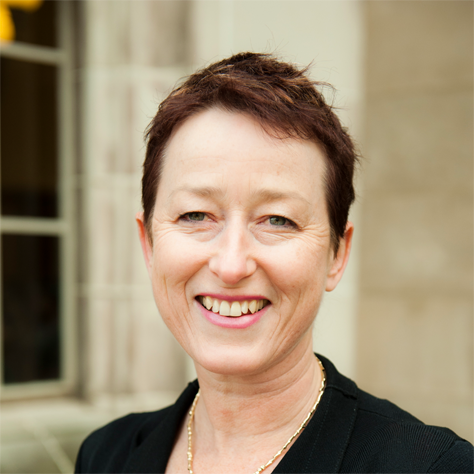 The findings from this study suggested that poor oral health may be due to their migration experience and difficulties accessing services; there are socio-cultural differences in relation to child oral health knowledge, beliefs and practices; and oral health promotion needs to incorporate the discussion of traditional oral health practices. Based on the findings from this qualitative study the next phase of Teeth Tales was designed and piloted to explore the implementation of a community based child oral health promotion intervention for children from a migrant and refugee background. The pilot study, conducted in 2011 in the inner city suburb of North Richmond, aimed to determine if the model was feasible and acceptable in a culturally diverse community setting. Trained peer educators recruited families from the Vietnamese, Sudanese and Oromo communities to be involved in the intervention. Learnings from the pilot phase provided valuable information to inform modifications for the subsequent trial; particularly relating to the inclusion of cultural organisations as partners; altered study design and recruitment processes and the consideration of the relevance of the program to newly-arrived migrant communities due to resettlement issues. It was then ready for a larger scale exploratory trial. Teeth Tales is a research study that adopted a culturally competent, community participatory approach to child oral health promotion. Families from an Iraqi, Lebanese or Pakistani background with children aged 1– 4 years, residing in metropolitan Melbourne, were invited by trained peer educators from their respective communities to participate in the trial using snowball and purposive sampling techniques. Moreland, a culturally diverse, inner-urban metropolitan area of Melbourne, was chosen as the intervention site. The intervention comprised of peer educator led community oral health education sessions, with the intent to improve oral health through increased oral health related knowledge, confidence and the adoption of positive oral health behaviours. The intervention also endeavoured to enhance the cultural competence of services for refugee and migrant families, including family and dental services, through a Cultural Competence Organisational Review (CORe) for participating community health services and local government. 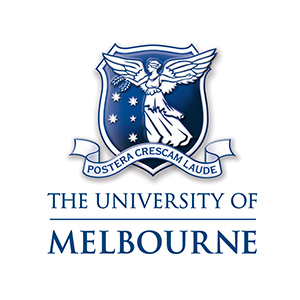 A total of 688 children from 521 families from a Lebanese, Iraqi and Pakistani background living in metropolitan Melbourne were recruited into the study. The Teeth Tales study has been a 9 year project led by The University of Melbourne and Merri Community Health Services (MCHS) in partnership with Dental Health Services Victoria, Moreland City Council, Arabic Welfare, Victorian Arabic Social Services, Pakistani Australia Association of Melbourne, The Centre for Culture, Ethnicity and Health, North Richmond Community Health and Yarra City Council. 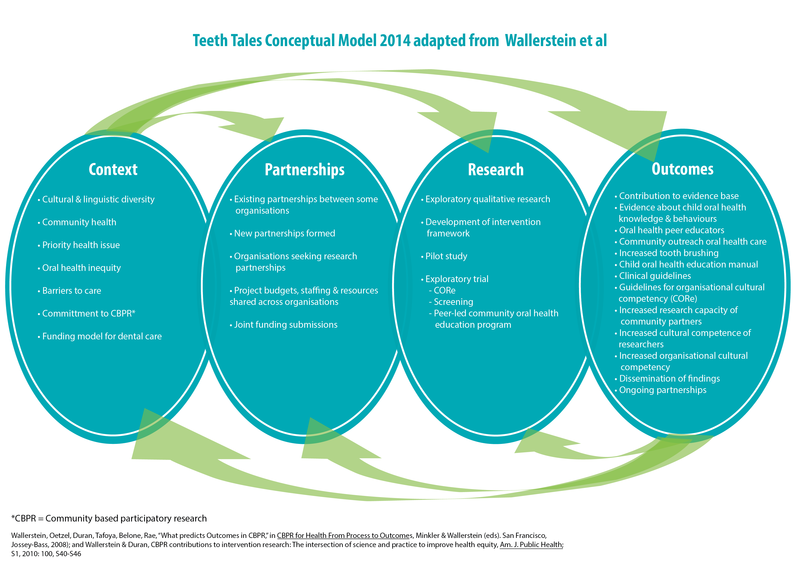 A conceptual model for the Teeth Tales study was developed by the project partners in 2014 based on the Wallerstein et al conceptual logic model of community based participatory research (CBPR). This model is a concise way to present the multiple facets of the Teeth Tales study and also to aid in dissemination of the project findings. This CBPR conceptual model can be applied at any stage of participatory research. This project was successfully completed in 2014. A showcase of the study findings and outcomes was conducted on the 23rd of October 2014. Read about the project showcase here. 'Teeth Tales tells a story', VOICE vol 10: 11, 2014. Gibbs L, Gold L, Kulkens M, Riggs E, Gemert CV & Waters E. Are the benefits of a community-based participatory approach to public health research worth the costs? Just Policy. 2008; 47: 52-59. Waters E, Gibbs L, Renzaho A, Riggs E, Kulkens M, Priest N. Increasing Cultural Competence in Public Health and Health Promotion. In Heggenhougen K (ed) International Encyclopedia of Public Health. Elsevier Inc., Oxford UK. 2008, pp38-44. Gibbs L, Waters E, Renzaho A, Kulkens M (2007) Moving towards increased cultural competency in public health research. In A. Williamson & R. DeSouza (eds) Researching with communities: Grounded perspectives on engaging communities in research. London: Muddy Creek Press, pp339-355. The follow up measures in the Teeth Tales trial showed improved child oral hygiene, improved parent knowledge of tooth brushing technique and increased knowledge of the role of fluoride in the water, in the intervention group. These are important results particularly given the demographic profile of the participants and evidence of population level inequalities in child oral health in relation to social disadvantage and family migrant background, indicating the promise of the Teeth Tales intervention model. The participatory approach of the study has ensured community, service provider and government input at all stages of the study design, implementation, interpretation of results, and dissemination of findings and resources. There have been multiple impacts on policy and practice at State government, local government, cultural and community organisation levels due to the findings from the Teeth Tales study. Teeth Tales peer educators were employed by Merri Community Health Services as community workers. Dental service use by migrant pre-school children is very low. The relationship between parent perception of their child's need to dental treatment, children's actual treatment needs, and dental service use is currently not aligned. Parent's length of residence in Australia, consumption of sweet drinks and parent education are predictors of child caries experience. Adding sugar to drinks is an additional risk factor for cavitation. Recruitment and retention of participants was a challenge in this study. It was particularly challenging for the Pakistani peer educator group, who were not part of an existing ethno-specific agency. This was mainly due to the difficulty of identifying eligible families without an existing client base and network. The model for intervention delivery could be developed further to align more closely with existing community and social groups, events and services to encourage uptake of the intervention. We thank the generous contribution of families and participating organisations to this study. We also acknowledge the support of the Department of Education and Training. This project was funded by an Australian Research Council Linkage grant (LP100100223), with cash and in-kind contributions from Linkage partners—Merri Community Health Services, Dental Health Services Victoria, Moreland City Council, Victorian Arabic Social Services, Arabic Welfare and Pakistan Australia Association Melbourne. Additional funding support was also provided by Merri Community Health Services. Separate funding grants contributing to the overall research activities were also received from Dental Health Services Victoria and Moreland City Council. Salary support from the Jack Brockhoff Foundation for Lisa Gibbs and Elizabeth Waters is also gratefully acknowledged.